It looks like some retailers don’t even want to wait for a company to officially introduce its products to put it on sale. The currently rumored Samsung Galaxy Mega is now up for pre-order in Germany via Notebooksbilliger online retailer. 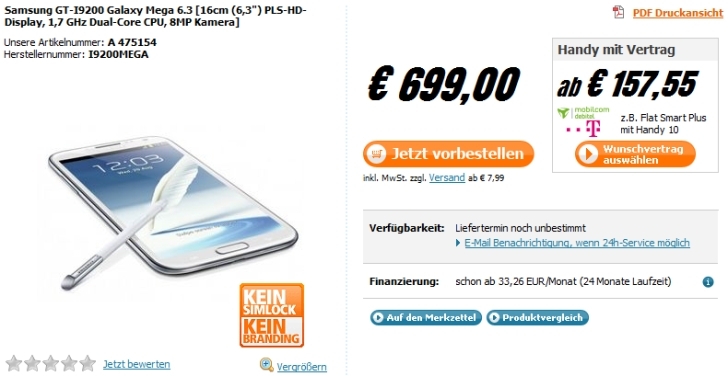 The smartphone has been priced at €700/$915, but it does not have a release date attached to it. For those unfamiliar with this unannounced device, Samsung Galaxy Mega is said to boast a huge 6.3-inch PLS HD capacitive touchscreen display. The phone will be equipped with a 1.7GHz dual-core processor, 1.5MB of RAM and microSD card slot for memory expansion. The Galaxy Mega is expected to ship with either Jelly Bean 4.1.2 or Android 4.2 operating system out of the box. As SamMobile points out, it would be unwise to pre-order such an expensive device before it’s officially unveiled, so we recommend against it.